If there can be a tip to make laundry a little more pleasant, you’d want to know it right? Well, I have 5 that are on the top of my list, plus a few extras sprinkled in. If you like to save money and make things easier, you are a Life-Hacker. Welcome to my world! 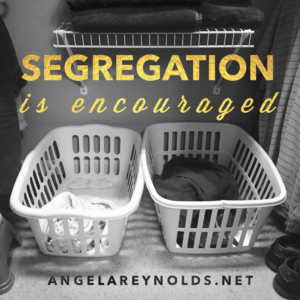 Segregation is encouraged! While this may sound racist, this by far is the best thing I ever started when I got out on my own. Spend the extra few dollars to have a set of clothes baskets. That’s right…you need 2! When you take your clothes off, separate your whites from the darks. Your clothes should go “in” the basket….NOT on the floor. You’ll just have to pick them up later if you go that route! Now that you have the clothes separated, you can easily throw a load in the washer without the extra time to separate. Why is this so good? Well, what if you only had a few whites and not a full load? You wouldn’t know till you separated them all out. Now you know right off if you have a full load or not, and which ones (whites or darks) need to be washed. Want another life hack? I go one step further when getting ready to wash one of the baskets (white or darks). I separate the pants from the shirts. That way, once the washing and drying is done, I am doing the same type of steps for the same type of clothing. It just all goes a lot faster, and that’s what we want, right? To get this task done and over with so we can move on to a more interesting moment in life. as well as the energy cost, I’m also removing deadly toxins from my clothes and household. Don’t even get me started on how UN-healthy those little babies are. And you know that they can mess your dryer vent up and cause fires, right? Another whole topic that I’ll just leave right here. If you want to see how scary other household items are, check out this video I took in Walmart! Stop throwing your money away- literally! Lint- you mean, there’s a way to recycle the lint? Yes there is! And no, we are not going to make dryer balls from it. However, if you have a fireplace or you like to camp, you need to save up your lint from each load and have it ready for when a nice warm fire is on your horizon. Get an empty bag or container to serve as your lint collector. With each load of clothes you dry, empty out the lint vent and add to your lint collection. It’s kinda like collecting dust, but a lots cooler and useful. When you are ready to start a fire, pull down a little ‘wad’ (very technical term) and light it. The lint will quickly catch fire and will take several minutes to burn. It’s an adequate amount of time to get your kindling lit and going. Who knew, right? If you have an experimental intrigued teenage son, like me, these little lint wads will keep them busy on the concrete drive for hours (or atleast a good 30 minutes). You really can recycle almost anything. Think of the time saver here as you have cursed that damp wood that refused to light. have somehow worked up a community of little fuzz balls. Or maybe you have thunder thighs andthe comfy pants have taken on a bumpy look and feel in the high thigh area. 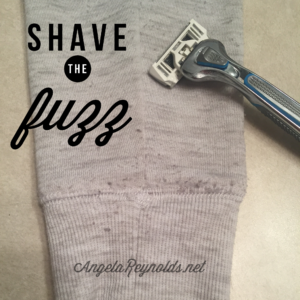 Take an old razor (you were going to throw it out anyway) and use it to shave off the unsightly fuzz. Smooth strokes on a hard surface will get the job done. Store your fuzz razor in the laundry room. You will not want to mistake that on your delicate skin later. Stop paying retail for laundry detergent! A little planning can save you tons of money (like a boat-load). And no, it’s not hard. If you can measure and hit the start button on a food processor, you can make your own detergent for pennies per load. My estimate is that it cost $.02-$.03 per load! WHOA is right! Here’s the video showing you just how QUICK and EASY it is! Did you notice in the picture of my dryer above that one knob is missing? Well, it’s not really missing. It was purposely removed. You see, I despise the sound of the dryer buzzer. Even though I would turn the knob to “off”, others in the family would turn it back on. Yes, they were probably just trying to get underneath my skin. I fixed that….I just took it off and hid it. Consider this a bonus tip of a Life Hack! If you have found this blog post remotely helpful, or atleast comical, please share with a friend. Friends share life hacks with friends! Just sayin’.